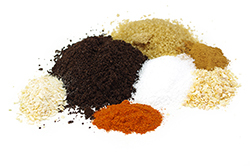 I like to use coffee in grilling rubs because it adds an earthy flavor unlike anything else. It’s a strong ingredient, but when it’s paired with salt and sugar, the flavor is quite good on pork. If possible, I get the coffee ground finely, but it’s really not necessary. As the meat cooks, the coffee grounds hydrate and become soft and part of the crust. 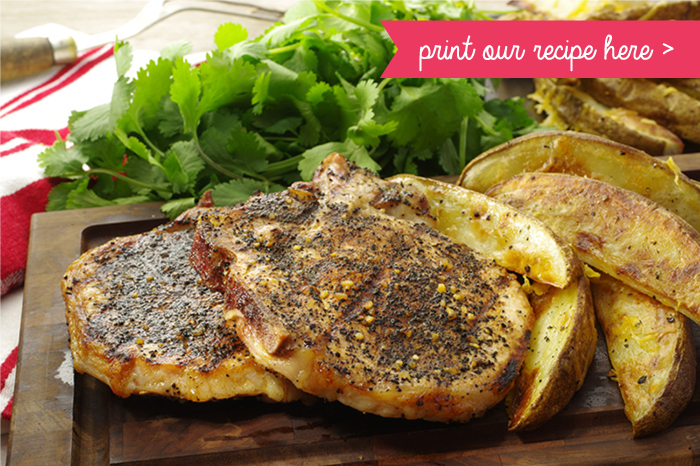 Cheesy double-baked potatoes contrast nicely with the sweetness of these chops. Prepare an outdoor grill to cook direct over medium heat. In a small bowl, combine the coffee, salt, sugar, cayenne, granulated onion, granulated garlic, and cinnamon. Mix well. 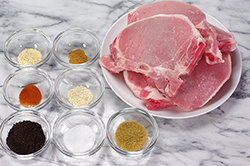 Season the pork chops on both sides, dividing the seasoning evenly and using it all. 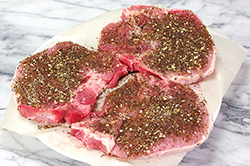 Place the chops on the cooking grate and cook for 4 to 5 minutes, until deep brown. Flip the chops and cook for 4 to 5 minutes more, until deep brown and cooked to an internal temperature of 150°F/65°F C. Transfer to a platter to let rest for 5 minutes, then serve.